Biella is the largest town (population of over 40,000) and capital of the province of Biella in Piedmont, in northern Italy. There is also a little airport at Verrone, in Biella province. Biella town is connected with the stations of Santhià and Novara on the Torino - Milano line. Trains are run by Trenitalia, with one train every hour. The trip takes about 1hr 30min. The town is not large, and most of the sights can be seen comfortably on foot. Getting to Biella Piazzo (the upper town) can be quite tiring on foot, but there is a funicolare (a kind of tram) linking the two parts of the town. There are bus lines running through the city and connecting Biella to nearby towns and cities. Biella has a great and important heritage in architectural, artistic and archaeological fields. From the findings of the Roman era preserved in the Museo del Territorio (Museum of the Biellese Territory), to the Romanesque architecture, to the splendid Baptistery and by the bell tower St. Stephan, Biella offers many interesting historical sites. The medieval village of Piazzo, built at the top of a hill, differs from the rest of the city because of its very old buildings, arcades and paved streets. You can still view the ancient doors once used to close the village off. Piazzo is host to a small but beautifully restored synagogue, at the top of a medieval house in the historic Jewish quarter. In rare occasions, it is open to visit to the public. Below Piazzo lies the rest of Biella. Here one can explore some good examples of Renaissance architecture: the Basilica and the cloister of St. Sebastian (the latter is a magnificent example of the Renaissance architecture, richly frescoed inside) the Baroque church of the Holy Trinity (facing the busy pedestrian street) and not very far from the Baptistery. Along the Cervo river are some imposing structures, evidence of the 1800s industrial era starting Biella's fabric industry. The recently opened Museum of the Territory of Biella represents an ideal starting point to discover what this area is all about. Here you can visit various collections of local interest. One archaeological site worth noting is a goldmine of the Roman era in the Bessa Natural Reserve. The territory surrounding Biella is home to Sanctuaries devoted to the Virgin Mary: they are among the most beautiful and well known of the Piedmont region. The most famous, Oropa, a UNESCO World Heritage site, is in a picturesque valley and is devoted to the Black Madonna (Black Virgin of Oropa). According to popular tradition, it is thought that St. Eusebius, bishop of Vercelli in the 4th century AD, started this Christian site, and carried the wooden statue of the Black Virgin, made by St. Luke, from Jerusalem to Oropa. From a single building, the devotional complex now has a cloister with the Old Basilica, a new Basilica and its side buildings, where more than 300 rooms host pilgrims and tourists alike. The sanctuary is part of the CoEur devotional path. The Library and Historical Archives are open to the public upon request. While at the Sanctuary, one can also visit The Museum of the Treasures and the Royal Apartments, or walk through the botanical garden. Along with Oropa, other Sanctuaries surround the city of Biella: the Sanctuary of Graglia started in 1616 as the 'New Jerusalem' for pilgrims coming back from Palestine. Most of the chapels that were built are now part of a bigger basilica. On top of the hill near the Sanctuary, the valley produces an echo that repeats words up to eleven syllables. The Sanctuary of Andorno is a hospice-sanctuary set up between 1602 and 1606 and devoted to St. John the Baptist. It is not a crowded place: solitude and silence allow visitors to enjoy the beech forest and the grey-stone church. The Wine Routes - The itinerary through the lands and wines of the Biella district departs from Lake Viverone, a popular resort surrounded by the slopes producing the Doc wines of Canavese and Erbaluce. In addition to the water sports offered by the resort, the lake's natural environment is perfect for pleasant rambles on foot, bicycle or horseback. Roppolo Castle, headquarters of the Enoteca Regionale della Serra, is nearby where all the region's wines can be tasted and purchased. From there, Biella is within easy reach by road, where it is possible to visit the town's medieval centre, Piazzo, try Canestrelli, the town's delicious traditional sweet, or Ratafià, a characteristic liqueur produced in nearby Andorno, before visiting Europe's third largest Sanctuary at Oropa, a monumental place of pilgrimage. This is also an obligatory culinary pause to enjoy the Sanctuary's renowned hot chocolate, or a plate of polenta concia (maize porridge with fondue cheese) in one of the numerous nearby restaurants. From Biella town you can visit the small town of Candelo, known for its beautifully preserved late medieval fortification, the Ricetto. Spread over 13,000 square metres, the Ricetto (the Italian name means "refuge") is listed as one of the best conserved in Europe. Candelo itself is surrounded by one of the district's nature reserves, the Riserva Naturale della Baraggia, a wild and evocative apparently flat plain linking Biella with the Po valley. From Candelo, the itinerary proceeds toward the east of the district, along the modern highway between Biella and Cossato, to visit the district's other Doc wine producing areas, Lessona, Bramaterra and Coste del Sesia. This is the green heart of the district stretching from Masserano, where a visit to the medieval centre is a must-do, to Sostegno, an enchanting little village immersed in the green hills. Well known among mushrooms hunters, the area is also the ideal place for rambles through its beautiful vineyards in any seasons, along the footpaths that lead to the Valsessera, a mountainous area between Biella and the Sesia valley. This wonderfully uncontaminated environment is still home to chamois, deer and marmot. Naturally, the area has a good number of restaurants offering the district's traditional dishes, accompanied by the wines these splendid sun-kissed hills produce each year. Via Italia - a characteristic Northern Italian main street with historical building winding through the old town, lined with shops and cafes. Mosca butcher shop - Wonderful selection of cheeses, meats, local products, and prepared meals (Via S. Filippo, 16). Biella is internationally known for its production of high quality wools and yarns, so business is taken very seriously here. Well equipped hotels and top quality conference centers are widely available for meetings and conventions that are set in a historical-environmental context of great importance. More than 50 outlet stores are found alongside Europe's most prestigious textile companies. Here quality and good prices come hand in hand; what could be a better souvenir from Biella than a cashmere coat or a beautiful piece of fabric purchased at cost? Cheeses - The Biellese is rich in cheeses, one of the best known of which is toma, a hard cheese made of cows' milk that has a long tradition across Alps. It is produced using full-cream (Maccagno) or partially skimmed milk, and also the cheeses of the Biellese valleys are protected by a D.O.C. warranty mark of the Piedmont Region. Beddu, a cheese made of skimmed milk that is as wide as toma but only two fingers high, is typical of the area around Pralungo: it is eaten fresh or after being matured on straw. The fresh cheeses are characterized by their quality and variety (sordevolo, ricotta, tumin), and this is also true of the goat cheeses, be they fresh, mature or variously flavoured. Salamis - The most widespread are salam 'd l'ula, (i.e. preserved in fat), which are prepared using pork, salt, pepper and, sometimes, red wine: equally characteristic are salam 'd vaca (beef), salam d'asu (donkey), and those made from goat's meat. 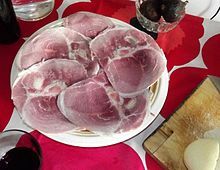 More localized examples include salam 'd patata (which includes boiled potatoes and little blood) and paletta di Coggiola, a shoulder of ham flavoured with salt and pepper, that is then packed into bladder skins and left to dry in the air. Cheeses and salamis can be found in specialist shops, and during weekly markets and village fairs. Sweets - Torcetti (sugar-coated biscuits made of a crispy and buttery pastry), paste 'd melia (made of cornflour) and turcetùn (large torcetti made using a less rich pastry) are still produced according to traditional recipes by some confectioners (particularly in Andorno, Pollone and Biella). The confectioners of Biella and Cossato make canestrelli (fragrant wafers made of chocolate and hazelnuts). At Crevacuore, it is possible to find home-made canestrej, which are chocolate wafers cooked between the plates of a red-hot grill and prepared according to a recipe that dates back to the 17th century. In Mongrando, palpiton is a typical bread and apple cake, often prepared for the town celebrations. Honey and fruits mustards - The large variety of blossoms in the area make it possible to choose from among a wide range of honeys, the most common of which are acacia, chestnut, linden, rhododendron, dandelion and mountain flower. In the Biellese, as well as being used as a sweetener, honey is traditionally served with polenta. During the course of village markets and festivals, it is still possible to find apple and grape mustards, which are prepared by slowly boiling the fruit (sometimes for more than 12 hours) in order to create a thick, dark syrup to accompany boiled meats, fresh cheese, polenta and paletta. Primi piatti - Together with dairy products, the real protagonists of this originally genuinely rustic cuisine are its soups, broths and polenta, a type of corn-meal mush. One of the traditional dishes of the Oropa valley (but whose fame haas now spread beyond the borders of Biellese) is "pulenta cunscia", a soft and creamy corn mush cooked for a long time in a special copper pot called "paiolo", in which a large quantity of local cheese is melted and mixed with tasty dairy butter; and the same condiments are used to flavour "ris an cagnùn", a dish of boiled rice mixed with toma and lightly fried butter. Both of these simple and ancient preparations bring together the resources of the Alps and the plain. Rice is also a fundamental ingredient of "mactabe", a thick soup that made up the evening meal for many generations of the people in the Biellese, "ris e riundele" (rice and malva), and "minestra marià" (rice with beets or wild spinach), to name just some of the primi piatti which, depending on the season and the valley, contribute towards the gastronomic repertoire of the province. The bread-based soups also have a wide variety of flavours, and include the excellent "supa mitunà" which, in the spring, is enriched with the unpredictable - sometimes sweet, sometimes bitterish, sometimes very marked - taste of wild herbs and, in the winter, is completely transformed by the use of leeks and savoy cabbage. Secondi Piatti - Meat, which was once only rarely and triumphantly presented (stuffed hen, rabbit in "scivé" and stuffed "sacoccia" were reserved for special occasions) now enters as a timid ingredient, together with eggs, vegetables and garden herbs, in roulades of "capunet" - wrapped in beet or cabbage leaves - squash flowers and onions. There are many different types of salami (one of the most common being "salam 'd l'ula": i.e. preserved in fat), which are also used in the preparation of such traditional dishes as "frità rugnusa" (a type of salami omelette) or "verzata" (a rich soup of savoy cabbage and salami that is almost a meal in itself). The trout of the mountain streams and the whitefish of the Lake Viverone are justly renowned for their delicacy. Specialties - Although every village has its own particular sweet, one that is typical of the Biellese as a whole is "l'arsumà", a soft mousse of egg and sugar diluted with milk or wine, which should be eaten with torcetti and biscuits fresh from the oven, or with the thin cornflour wafers called "miasce". The mineral waters of the Biellese are famous for their exceptional lightness (the water Lauretana, low in mineral content, today is the heir of an ancient hydrotherapeutic tradition), but there is also no lack of wine, including some well-known D.O.C. ; Biella is also the home of Menabrea, one of the best lagers in the world. Finally, particular mention should be made of Ratafià di Andorno, a drink made of wild cherries steeped in alcohol according to a 500-year-old recipe. Bramaterra - Born from the fortunate combination of the Nebbiolo vine and the particular nature of the terrain of this region, which provides its natural habitat, it is a formidable wine, full of flavour, velvety, with a characteristic garnet red colour and a pleasantly bitterish undertone. Its production area lies between Masserano, Brusnengo, Curino, Villa del Bosco and Sostegno. An ideal companion for: game and red meats in general. Grape: Nebbiolo (Spanna) 50/70%, Croatina 20/30%, Bonarda and Vespolina, alone or together, up to 20%. Minimum alcohol content: 12%. Ageing: obligatory 2 years, of which at least 18 months in wooden barrels. Canavese - Most recent addition to Piedmont's D.O.C. wines. The appellation "Canavese" is divided into "Red", "Rosè", "White", "Nebbiolo" and "Barbera". Production area: Cavaglià, Dorzano, Roppolo, Salussola, Viverone, Zimone. Coste della Sesia - Very recently approved according to D.O.C. regulations, the wines of this appellation are divided into: "Red", "Rosè", "White", "Nebbiolo", or "Spanna", "Bonarda" or "Uva rara", "Croatina" and "Vespolina". Production area: Lessona, Masserano, Brusnengo, Curino, Villa del Bosco, Sostegno, Cossato, Mottalciata, Candelo, Quaregna, Cerreto Castello, Valdengo and Vigliano Biellese. Lessona - A rare and precious wine, this is produced in the hilly area from which it takes its name, a few kilometres from Biella. A garnet red colour with hints of orange as it ages; intense bouquet, fine and delicate, reminiscent of violet; dry, pleasantly tannic flavour, agreeable, with great character and a persistent after taste. An ideal companion for: game and red meat in general. Grape: Nebbiolo (Spanna), Vespolina and Bonarda may also be present up to 25%. Minimum alcohol content: 12%. Ageing: obligatory 2 years, one of which in wooden barrels. Erbaluce - One of the Region's few white wines. Production area: the province of Turin, with Caluso as its epicentre, extending up to the Canavese and Biella districts. In the province of Biella it can be found in Viverone, Roppolo and Zimone, where the terrain is of glacial origin and ideally exposed. Erbaluce di Caluso - Intense straw-yellow with hints of gold; subtle, delicate bouquet, reminiscent of flowers of the field; dry, agreeably acidic persistent taste. An ideal companion for: appetizer and fish. Grape: Erbaluce 100%. Minimum alcohol content: 11%. Ageing: not contemplated. Caluso Passito - A brilliant yellowy-gold colour with a hint of shadow; characteristic ethereal, delicate bouquet; its flavour is sweet, harmonious, full-bodied and velvety, the result of a long process which demands that the grapes are hand-borne to the press to avoid damage by lying them on straw lined gratings. Before pressing, the grapes are left to "appassire" (a kind of drying process) for a few months (hence the name "passito"). Grape: Erbaluce, sometimes with local Bonarda (5%). The grapes must be naturally dried to give a sugar content no lower than 30%. Minimum alcohol content: 13,5%. Ageing: obligatory for 5 years, blending with wines from other vintages is allowed in this time. Erbaluce Spumante Brut (sparkling) - Most recent addition to the Erbaluce family, this wine is slightly sparkling with a pale straw colour; light evanescent froth and fine, persistent perlage; characteristic delicate bouquet and dry, fresh, fruity flavour. Grape: Erbaluce 100%. Minimum alcohol content: 11.5%. Ageing: none. Ratafià Rapa. One of the oldest and important Piedmontese liquor, from Andorno Micca. Few people know that Biella is home to one of the lightest waters in Europe. Lauretana, the mineral water company, bottles it at the source and distributes it around the world. This city travel guide to Biella is an outline and needs more content. It has a template, but there is not enough information present. Please plunge forward and help it grow! This travel guide page was last edited at 00:44, on 1 February 2019 by Wikivoyage user Ground Zero. Based on work by Wikivoyage users Traveler100bot, Beaubiella, Hiàn, Ikan Kekek, AndreeBot, Andree.sk, Ibaman and Wrh2Bot, Wikivoyage anonymous user 73.222.188.186 and others.